The fourth annual Civilian Conservation Corps On-The-Air weekend will be held the second full weekend in August, 2017. The event will start Saturday at14:00z (10:00am EDT) and run until Sunday 21:00z (5:00 pm EDT). The Civilian Conservation Corps came into being in the spring of 1933. Its goal was twofold: to provide needed economic relief to families suffering from the effects of the Great Depression and to protect and develop the natural resources of the United States. As radio played a big part in how the camps communicated with each other, we want to honor the contribution that "The Boys" of the corps made to our country by putting the sites of the CCC camps back on the air. We would encourage you to activate the actual location of one of the camps however, if it is no longer accessible or you cannot get permission to set up on the site, you may operate from one of the project sites the camp worked on. Many state and local parks have buildings that were constructed by the "CCC Boys" and would make a suitable place to not only honor them but also promote amateur radio at the same time. 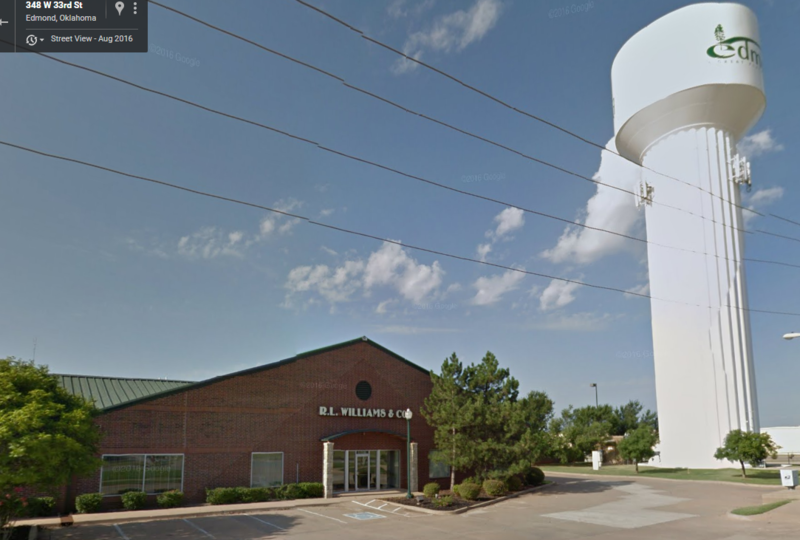 Due to the weather forecast, the W5RLW tailgate has been moved forward to May 6.
located just under the ninety (90') foot tall Edmond Water Tower. Enter on the west end and drive around to the rear parking lot. COST: Free tailgate, no parking fee. Free coffee, donuts, and bottled water while they last. You may bring a small table to display your wares...Only one requirement / request. PLEASE do not leave any articles behind to be thrown away. TALK-IN - FREQUENCY 146.790- (minus offset ) PL tone -100 hrtz. Our friend Mike, aka Coaxman Dealer, will be there with all kinds of coax, window line, and connectors. E-mail Mike, KM5QX, now if you need something custom made and he can bring it Saturday. 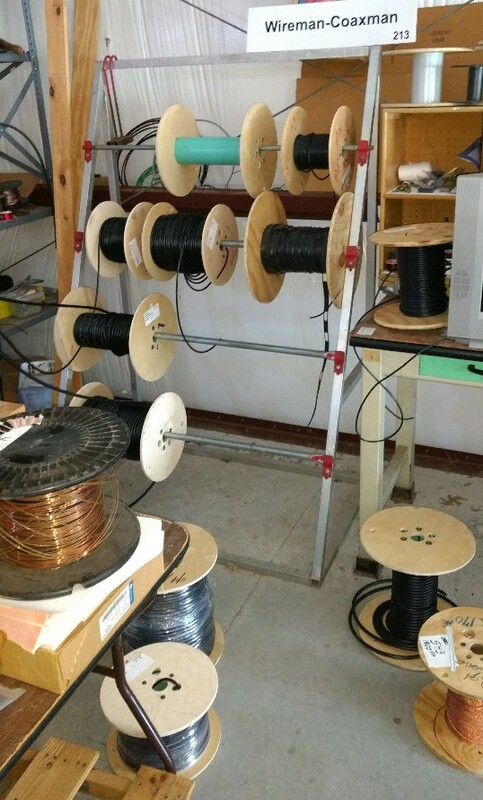 The photos below are of Mike in his workshop and a photo of several spools of coax, window line, etc. His copper clad steel wire is excellent for making antennas. it's impossible to see from very far away. 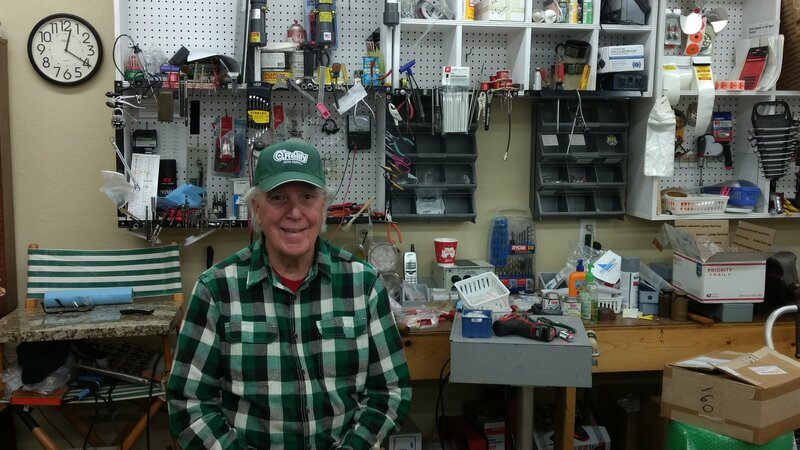 If you go visit his workshop he can show you the proper method for soldering connectors, etc. As a ham with years of experience he has a lot of great suggestions and he will try to save you some money and from making mistakes. :-) If you have never met Mike, come by and say hello! I am owner / operator of Clear Signal Products, LLC. We sell a complete line of "Wireman" coaxial cables, antenna wire, ladder line, baluns, plus many related amateur radio accessories. Baluns are our speciality as we have developed and manufacture a variety of 4:1 current baluns used exclusively for off-center-fed dipoles and horizontal loops. We also manufacture 1:1 current baluns for unbalanced feed lines. Our company is privately owned. We travel mostly to division 5 states at major Ham Fests in Oklahoma, Texas, Arkansas, Mississippi and Missouri. The Coaxman logo/mark is a registered trademark with the United States Patent and Trademark Office. Visit us online: www.coaxman.com and our email site is: orders@coaxman.com My wife Cheryl, KD5DUK, and I travel together at major Ham meets and enjoy the associations with fellow Hams during the year. Our customer list is maintained for communication and service with and for our customers only, and is neither shared, sold, nor published. Your account details are between you and The Coaxman, period. I've resided in Mustang, Ok for the past 35 years. Mustang is a small community within the South West corner of the Oklahoma City metro complex.. Thanks to Edmond Amateur Radio Society for this information. Ham Holiday 2017 New Venue Is Official!! The Tower Hotel In NW Oklahoma City is the new venue for Ham Holiday 2017. Go to http://www.towerhoteloklahomacity.com/ for information on the 'Tower'. Located on the Northwest Expressway and just east of I-44/Hefner Parkway, the 'Tower' is easily accessed from the NW Expressway coming from the east or west. The exhibit hall is 10,000 sq ft; we'll be using around 8,500 this year....and the A/C works. The seminar rooms are collocated with the exhibit hall. Parking for +1,000 cars; dedicated entrance to the convention area lobby; large pre-event area; easy access from unloading area to the exhibit hall. We'll be posting photos on the Ham Holiday website with more visual detail of the new venue. We are inviting several 'food trucks' from the OKC area to be at HH on Saturday from 8 AM to 2 PM. There are several eateries within walking and short driving distance of the 'Tower'. ARES-Oklahoma is looking for some WEB Development help. We have a bit of updating and changes that need to be made to www.ARESOK.org The page is migrating from ASP to PHP and we also need to keep in mind for the future that more and more functionality needs to also be mobile. Our current webmaster has done a fantastic job, however family and employment are demanding more of his time... so we're needing some help. If you have experience with ASP (current) and PHP (future) and are willing to volunteer your time and talent please contact our ARES-OK Webmaster Roland KC5UNL or N7XYO. Thomas Webb WA9CFM/5, announced today that April 1, 2017 marks the first transmissions from OCAPA’s brand new 80 meter repeater project in Oklahoma City. The intended use of this recently completed project, shown here, can finally be released to the general public. While the stated cause has always been that this is one of the required 2% local art expenditures for federal highway funds, the true nature of the project can now be disclosed. ODOT Director of Operations, Paul Green said, “this whole project started with a rather severe reinforcing bar (rebar) accident. We signed the delivery slip for about 80,000 pounds of steel, before the truck driver unloaded his truck. One of those tornadoes snuck up on us, and blew the rebar into a terrible pile. It sounded like a train, just like Mike Morgan said it would.” ODOT left the pile lay, until the OCAPA Special Projects team came up with the master plan. Webb said “the pile of rebar was stacked perfectly to make a Lazy L dipole. It appears the twin verticals increase the Q factor of the array”. Since we’ve been in a solar minimum for years, their first thought was to build the world’s first 80 M repeater. As you can see in this photo, a custom 80 meter duplexer had to be built to allow repeater operation. After a few quick calls to Wacom, they calculated that the can needed to be 50 stories tall. Famed QRP operators Kenn Goodson KA5KXW, and Ed Hatch AG5DV, made a confirmed QSO each other using a homebrew TX/RX setup of Kenn’s design. Their initial contact was made using transmitters that they thought were in the milliwatt range. It wasn’t until later that they realized their watt meter was rounding up from 502 nanowatts. Once the news had traveled regarding the Goodson/Hatch success, Peter Khor, AG5DB, hurriedly downloaded an 80 M transmitter app for his Android phone. Peter will be attempting the first SSTV contact using the repeater, sending an astronomy selfie photo from here, back to JU5PITER, located on the moon Io. The good people of OG&E have offered to provide their excess power from the wind farms popping up across the state. While the input power of the repeater is classified, the output power runs right up against the legal limit of 1,500 watts. Or is that megawatts? Nationally known DX’er, Normanite Victor McDaniel K5VL, has already commissioned a new version of the Golden Thumb award trophy. This trophy has been scaled up to match the fundamental wavelength of the 80 M repeater. The normal suspects have already filed for building permits with the City of Norman to construct a room large enough to hold this new trophy. When asked, Harold Black W5IFN, stated “This room addition has been in the works for some time, and I don’t have any expectations that I would be guilty of timing out the new repeater. For example, once when I was in the Navy, we had to add a larger engine room into a destroyer. The press initially thought that this addition would let this WWII destroyer carry more fuel for an upcoming future project. It was simply a coincidence that the minute the addition was complete…” and then the mighty 147.060 MHz repeater went silent. Denny WA6DKD, was seen exiting the Slaughterville public works complex, with a signed building permit in his hands, and would only respond “No Comment” to any question asked. At press time, the Gulf Coast Hurricane net was trying to negotiate the use of the W5MEL/80 repeater to provide an Inland relay for the upcoming hurricane season. The famed net was hoping that this could put an end to their QRM issues. So, the next time you think the bands are going south, turn on the HF gear, grab an FM modulator, dial up CTCSS tone 141.3, tune the dial to 3.935 MHz, and wait for the repeater id beeping; .- .–. .-. .. .-.. .-.. — — .-.. … ! They will continue to use Remote Hams on their Android devices in the mean time.